The type is described as being a "solid" primrose yellow by Edward McRae in his book 'A Guide For Growers and Collectors'. In his book 'Growing Lilies', Derek Fox describes it as saying "The type of the species is really a form of the var. burmanicum in which the purple throat markings are absent". 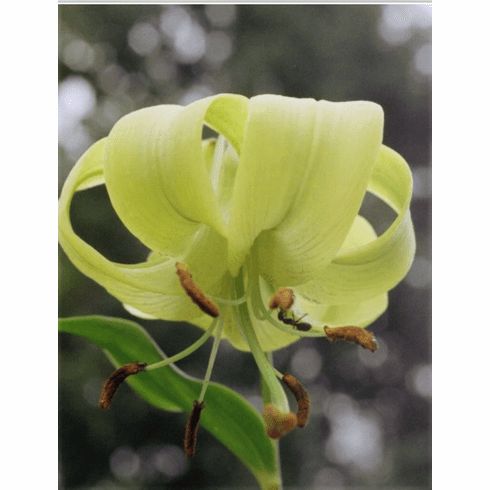 This is a very rare, never seen lilium species in commerce from all records of it. L. primulinum is often referred to as being L. nepalense, even in their published research papers on the Lilium species of China. Grower Rick Rodich who posted this photo, actually received in error one of the rarest of the rare in lilies. He reported it hardy in zone 4a. From Tibet, and Myanmar with its range extending into the NW portions of Yunnan, the pendant, primrose yellow flowers of this rare beauty are richly colored in a royal purple. If seed can be obtained, it should be grown in a sheltered spot or a cool greenhouse. As with so many of the native lilies, drainage is a must. It is reported that de Graaff succeeded in crossing Lilium primulinum with some of his best trumpets, but there are no recorded introductions from those crosses. We look forward to the day we can locate verifiable seed of this species and give it a try.